Situated in the Aegean Sea, Skopelos is the largest of the North Sporades islands which also include tranquil Alonissos and well known Skiathos, with its airport. It has developed into an important centre for truly relaxing vacations and continues to inspire a still small, but steady, number of admirers of the Greek lifestyle wishing to purchase property. People who buy property usually come over to live here for at least part of the year, sometimes offering their houses to one of the holiday rental companies over the summer, or simply retire to their new home on one of the beautiful Sporades islands. a Real Estate Agency located in Skopelos, one of the Sporades islands of Greece. We offer an expanding portfolio of town houses and country villas in Skopelos and Alonissos as well as land and commercial properties. Located on the island of Skopelos for 26 years, we have gained substantial local knowledge to secure a smooth completion of all transactions and can fully support you in becoming a property owner here. Our services are not limited to the purchase of property, but are also related to various property matters, including planning, designing, building, legal advice and property maintenance. Watch dolphins from the terrace of your country cottage with panoramic views. 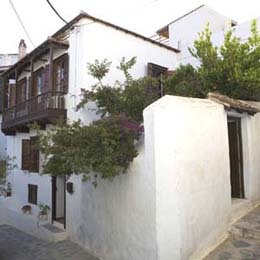 Enjoy your Greek neighbourhood within the maze of winding and picturesque streets of Skopelos town. Let us find you the land to build your own home you have always been dreaming of, tailored for your individual needs.